The Via Dolorosa winds through several Jerusalem old city quarters, a labyrinth of small alleys, sudden plazas and bustling commercial life that surround some of Christianity’s holiest sites. While “all roads lead to Rome,” in the Christian quarter all roads lead to the Via Dolorosa – sort of – and on to the Holy Sepulcher. The Holy Sepulcher is the holiest Christian site in the world – more so than St. Peter's in Rome. 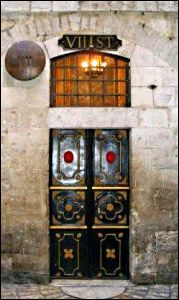 It houses the site where many Christians believe Jesus died, where he was prepared for burial, and where he was buried. The Via Dolorosa marks the last steps of Jesus in Jerusalem. Every Friday afternoon, Franciscan monks proceed along the Via Dolorosa, stopping at all the Stations of the Cross. Christian pilgrims may find it a unique spiritual experience to follow them. The procession starts at the Omariyah School of Islamic studies, where the Roman Antonia Fortress once stood, and which is the first Station of the Cross. If this doesn’t speak to you, you can also do this on your own. 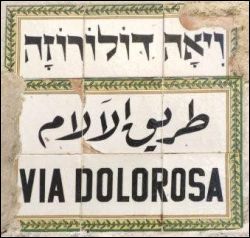 Take a detailed map with you – for all its fame, the Via Dolorosa is at times so narrow, you could easily miss it. Following the last journey of Jesus in Jerusalem requires paying close attention. The Stations of the Cross are marked – but not all in an obvious way. The station where Veronica wiped Jesus’s face is literally just an alcove in a wall – you’ll walk right past it and never notice unless someone points it out to you or you happen to be looking carefully. You may also want to download the Via Dolorosa mp3 tour as your own personal guide. It's free and it's a fantastic tour, chock full of interesting information. The extensive archaeological digs at the Monastery of St. Anne, where you can see remains of a Crusader church, a Byzantine church, Roman baths and reservoirs from the Second and First Temple periods. The church is considered one of the finest examples of Crusader architecture and is famous for its spectacular acoustics. Notre Dame of Zion Ecce Homo Convent, under which lies a gigantic water pool that dates at least to Roman times. The Romans covered the pool in order to build a large market place above it, and the pool was forgotten and undiscovered for 1,700 years. It is actually twice as wide as it seems – the Romans covered it with two arches, since they didn’t have the technology to build such a wide spanning arch. The nuns sealed off the pool with a wall when it was discovered that it leads to the Hasmonean water tunnel at the end of the Western Wall tunnels. The Austrian Hospice was built in 1863 and Emperor Franz Joseph I slept here. (Guess what, you can too!) 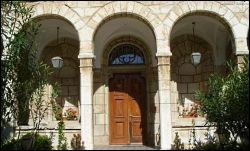 The British commandeered the building and used it as an officers’ training school, but in 1985 Israel restored the building to the Austrian government. Today, it houses a hostel and a cafeteria that specializes in Viennese cuisine. If you have a craving for sachertorte, this is the place – plus, the view over the rooftops of the old city is lovely. The garden, too, is an unexpected oasis amid the bustling city outside the walls. The Muristan complex and the church of St. John the Baptist. The Hospitalier knights who arrived in Jerusalem with the First Crusade, built their residence, a hospital and the church which stands to this day.